It’s not a fresh topic! Windows 7/8 Media Player no longer has the support of Blu-ray playback. But still now there are so many people looking for ways to play Blu-ray on Windows Media Player. So today let you show you the solution. How to Play Blu-ray on Windows Media Player? A popular solution for many people is to download and install a codec pack which includes the codecs Windows Media Player doesn’t have. The mediaplayercodecpack.com website offers a popular pack for Windows Media Player. The pack includes a number of popular codecs like Blu-ray, which allows you to watch your Blu-ray movies using Windows Media Player. The pack is free. You can download it on CNET or directly go to the developer’s website. If you have no desire for downloading the codec pack, why not try a piece of alternative Windows Blu-ray player software to play Blu-ray on PC successfully? And the Blu-ray Media Player from UFUWare is your perfect choice. It gets Blu-ray player software and free HD media player into perfect combination, allowing you to play back Blu-ray disc/BD Folder/ISO, common videos and up to 1080p HD videos smoothly on Windows PC. The newest Blu-ray discs released in the market can be played back as well. Noticeably, Blu-ray playback is a paid feature. But you could embrace the HD video, common video and audio playback without spending a dime. UFUWare’s Blu-ray player software also comes with advanced audio decoding technologies like Dolby, DTS, AAC, TrueHD, DTS-HD, etc. delivering extraordinary audio effect. See how to play Blu-ray on PC with PC Blu-ray Player Software. 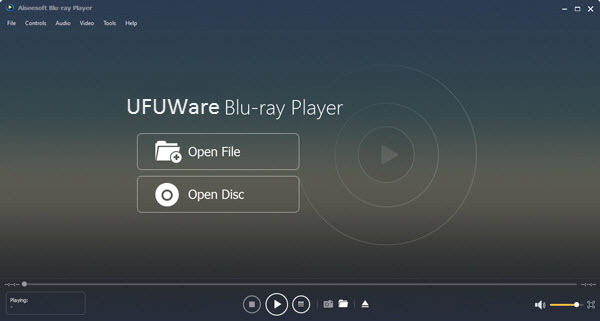 Another option is to use a UFUWare Blu-ray Ripper, which could help you convert both Blu-ray and DVD to video in formats like WMV, MKV, MP4, AVI, MOV, M4V, FLV, VOB and more. Then you can freely watch converted Blu-ray movies on Windows Media Player, or any other player, mobile devices, etc. You can get the Blu-ray converter free downloaded here and follow the guide here to know how to convert Blu-ray for playback on Window Media Player.